Its an endless sea of products to sift though to only rarely have that AHH HAAAA moment of finding a mesh maker you never knew and are feeling the warm and tingly creative juices for. Figured I'd make a thread for folks to share what creators they use and regularly derive from. Kind of a Recommends list. 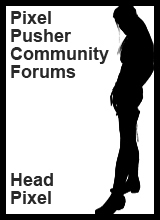 They don't have to be members here to recommend them, we just want to share mesh maker love and help our fellow Community members to maybe find someone new to get the warm and tinglies too!. Give a brief description of their style. Tell us why you like to use their meshes. Show us an example of something you derived from them that you really love. Re: Pimp Your Favorite Meshers to Derive From! I like PCP ( Prince Charming Productions ) and is the most often derived from product/s for me . The style is pretty basic which makes for easy and fast texturing . because it cuts down on the KB's ( kilobytes ) having a very large game room with over 100 arcade machines . avi pics and in such being cartoony to me they look fine at a distance and all blend in well together . is somewhat where they are designed for . perhaps even if she is reading would be interested to make one for me . Now this one has an interesting story behind it . If any of you are familiar with the Disney movie - Wreck it Ralph ? Wreck it Ralph movie the game characters come alive and its about what they do when Litwaks arcade closes . out of the 1st movie but I'm very hopeful they will consider stealing from me for a part 2 which is in production . a poster of her real life person to hang in the background alike an artist will do when basing a new art off a real person . This was after an absence from IMVU , so when I came back I still had the big head , hands , feet and so on . a persons real picture ( my poster hanging in the background ) to an IMVU avatar standing in front of it . .
as would just fit inside your chest . So to me the majority of IMVUsers with the very tiny heads look very pin headed . 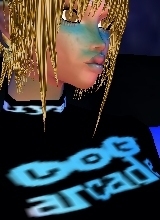 Then again I guess it could just be where i'm old school IMVU and therein prefer a more cutesy cartoony look . Honorable mention here another derivable I like to use and make is posters , that is wall arts to hang in rooms . Thanks for reading me , have nice day !